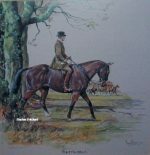 The Basil Nightingale Hunting, Racing and Military Prints and Paintings below represent a small selection of the many B Nightingale works available. If there is anything in particular by Nightingale that you’re looking for then please do not hesitate in contacting me on 07889 800857. The young Basil Nightingale was probably trained by his father and certainly worked with him on known pictures. It is said that Basil Nightingale worked at Melton Mowbray for some time, which is probably where he painted his famous picture of Tom Firr, huntsman to the Quorn, on Whitelegs. In 1902, Nightingale moved to Leamington in Warwickshire where for many years he was a prolific artists and sportsman. 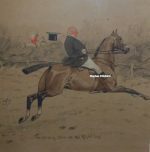 One painting is recorded of Lord Lonsdale (Master of the Quorn) jumping a railway track and the inscription on the back declares that Lonsdale is breaking the wide jump record set by Nightingale himself, who had quite a reputation as a fine horseman. He later moved to Banbury where he died in 1940. Basil Nightingale worked in Oil, watercolour and pastel and produced work of considerable quality from at least the age of 21. 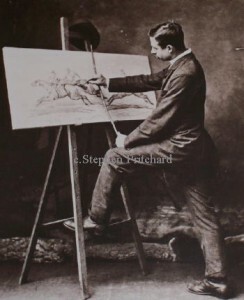 He painted a large number of hunting scenes as well as racehorses for the Prince of Wales, later King Edwards VII.